Recording GPS on the go has never been easier than with the smartphone. However, while your phone’s GPS capabilities may be sufficient for finding the nearest beer garden, it leaves a lot to be desired when positioning within centimeters is necessary. Leica’s Zeno GG04 Smart Antenna has been designed to bring centimeter-accurate positioning to consumer Android devices. 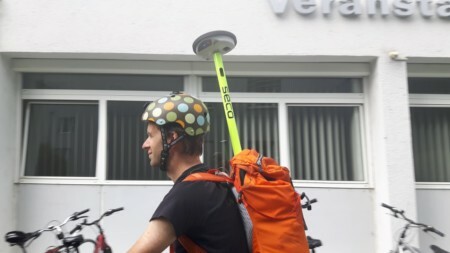 We, the location analytics team at Salzburg Research, grabbed the chance (many thanks to mobileGIS.at) to test the antenna for one week and here are our first impressions. The robust Leica GG04 antenna measures 186mm in diameter and 71mm in height. It weighs 0.8kg including the connected battery pack, which lasts for 8 to 10 hours. It is rated IP68 water-resistant; that allows for operation under rainy conditions (which is quite necessary in Salzburg due to the meteorological phenomenon of the so-called ‘Salzburger Schnürlregen’). Accessories include a padded carrying case, the battery charger, and a two-meter range pole that can be screwed into the antenna. Leica provides several free apps for connecting to the GG04. We have used ‘Zeno Connect’ from the Google Play Store. It works by replacing all of the phone’s internal GPS measurements with the measurements from the antenna. This happens as a background service, meaning that existing apps do not have to be modified. This replacement has to be allowed explicitly though; you have to enable the developer options in your phone’s settings and chose the Zeno Connect app as a mock location provider. The smartphone and antenna are connected via Bluetooth. The Real-Time Kinematic (RTK) provider has to be set in the app. 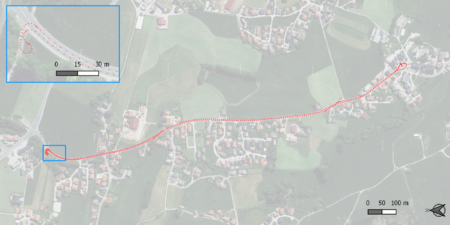 Zeno Connect can receive RTK correction data via internet, radio or from a beacon. We have used the Austrian Positioning Service (APOS) as correction data provider. After entering the RTK server credentials, the app shows the current GPS accuracy in the phone’s notification area. With the antenna fully charged and the Zeno Connect app set up, we were ready to start our trials. The first experiment was carried out by foot in front of our office building in the Science:City Itzling and it already showed promising results. Even between buildings, the calculated accuracy was between 1cm and 3cm. All of our apps received the high-accuracy signal without any problems. The antenna was mounted on the range pole; however, for the next experiments (by car or on bike) we had to be more mobile. Putting the antenna into a backpack led to GPS signal loss. Therefore, we had to find an alternative mounting to keep the top of the antenna completely unobstructed in order to obtain high-quality measurements. 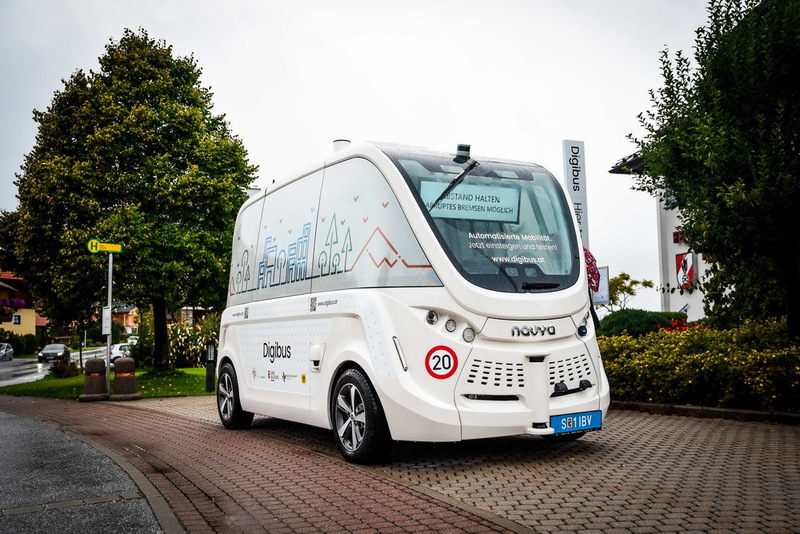 For the second experiment, we took the antenna to the test route where our autonomous shuttle Digibus is currently being tested for the first time in Austria on a 1.44 kilometers long test track in the village of Koppl (appx. 10 kilometers east of Salzburg City). For getting highly accurate GPS measurements, we fixed the antenna on the roof of a car with strong, adhesive hook and loop fasteners. We recorded the GPS signal from inside the car while driving with a maximum speed of 20km/h. There was no problem with either the Bluetooth connection or the antenna signal, and we were able to record the whole track without any technical problems. However, while starting with accuracy between 1cm and 3cm, at certain track segments it dropped to 30cm at worst. This might be due to overhead foliage blocking the antenna. In the next test run, we attached the antenna to the Digibus and recorded the test track again. As it could not be fixed on the roof because the bus’ LIDAR sensors would detect the device as an obstacle, several alternative antenna positions were tested. We found that whenever it was placed orthogonal to the ground, the precision of the GPS quality weakened to meter-accuracy or dropped altogether. The best spot turned out to be at the rear of the bus, where the antenna could be fixed horizontally into a groove of the chassis. This position was not ideal though, because the antenna was partially blocked. The accuracy ranged from 25cm at best to 120cm at worst. 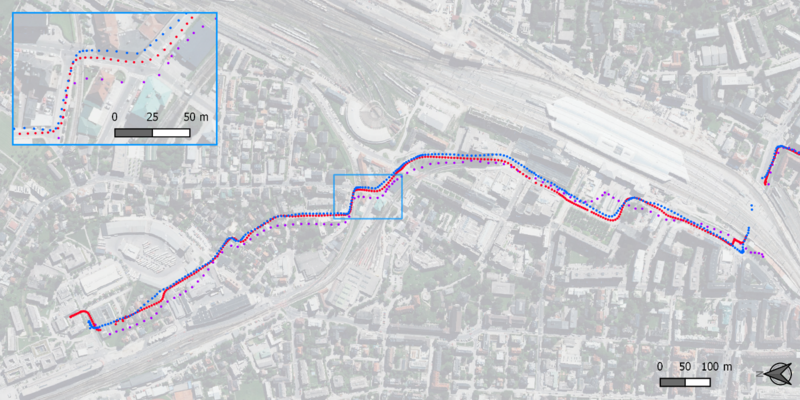 For our third experiment, we tried to record highly accurate position data during a bicycle ride in the City of Salzburg. Since we could not put the antenna in a backpack, we let it stick out with the range pole as can be seen on the picture at the top. Quite surprisingly, despite high buildings along the track, accuracy was constantly in the low-centimeters range, which is reflected in the track recordings. In the following visualization, the track recorded with the Leica antenna is compared with similar tracks recorded with smartphones. While the Leica antenna track represents the real path nicely, the other tracks show several inaccuracies. The average offset of these other tracks is 5.5 meters, however, near high buildings the offset rises up to 25 meters. 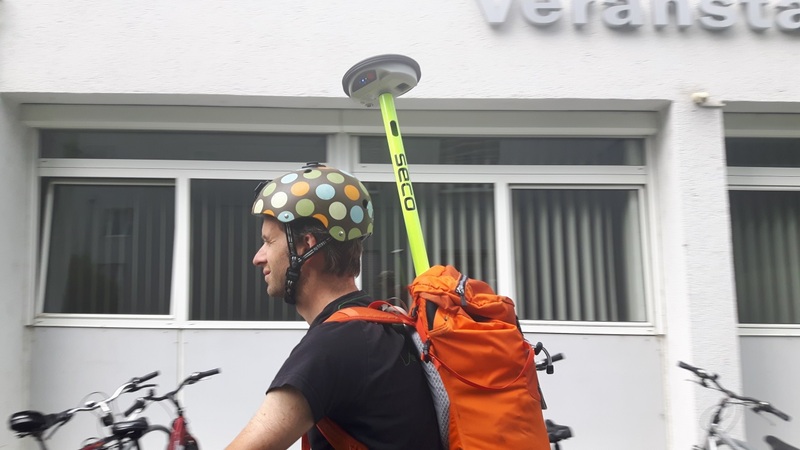 From our experiments we conclude, that Leica’s brand new GG04 Smart Antenna is a well-developed product that is able to deliver high-accuracy GPS measurements in centimeter range to customer Android Smartphones under free line of sight conditions. Its set-up is quick and easy: establishing a Bluetooth connection, entering the RTK credentials and allowing the Zeno Connect app to provide GPS locations. Done. No modifications of existing apps are necessary. During our tests, the battery pack lasted for six hours. A challenge is the positioning and secure attachment of the antenna. It was not designed for use in sports or during other highly dynamic situations. Our approach with hook and loop fasteners worked out for the performed tests, but it is certainly not a permanent solution. Since it has a winding at the bottom, a mount screw with a suction cup or clips might work. Another limiting factor is the sample rate. The specifications mention an update rate of 20Hz, which is not possible on current Android devices. Due to limitations of the operating system, GPS update rates cannot exceed 1Hz. For achieving higher update rates, a Windows device has to be used. Acknowledgements: Our thanks go to Martin Trimmel from mobileGIS.at for providing the antenna for testing. Wolfgang Kremser is a working student at Salzburg Research. 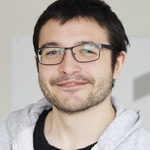 He develops body sensor networks, data processing solutions for Android, and hardware prototypes with Arduino.